SIM Card Manager With QWERTY Keypad | OhGizmo! By Andrew Liszewski on 02/07/08 • Leave a comment! If you’re using a candybar style cellphone that’s lacking a full alphanumeric keypad, adding multiple entries to your phonebook via T9 can be a bit of a pain. So not only does this external SIM card manager include a full QWERTY keypad, but it can also be used to backup 3 separate databases of phone numbers and other contact info. 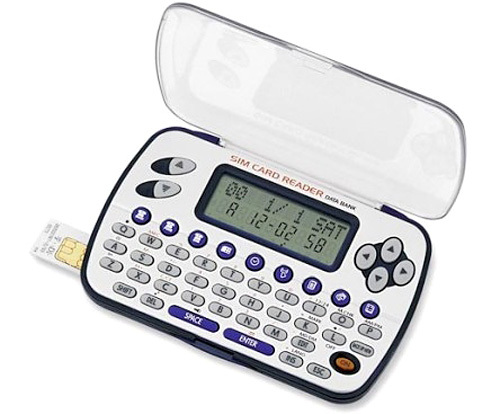 Of course given it looks like the Sharp electronic organizers of yesteryear, it’s not surprising that the SIM Card Manager also has a calendar, a 12-digit calculator, a memo function with search capabilities and even the option of password protecting your data. While having to carry this around kind of defeats the purpose of using a small candybar style phone, at about $40 from Gadgeter.com it’s still far cheaper than most QWERTY keypad equipped smartphones.